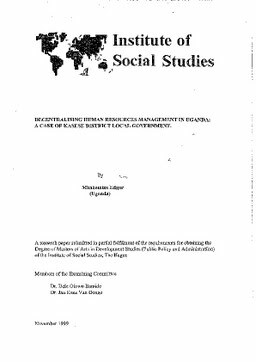 Erasmus University Thesis Repository: Decentralising human resources management in Uganda: A case of kasese district local government. Decentralising human resources management in Uganda: A case of kasese district local government. Uganda is located in East Africa. It is a land locked country sand witched by Kenya, Rwanda, Sudan, Tanzania and The Democratic Republic of Congo. It occupies a total area of 236,040 sq. km with land area covering only 199,710 sq. km. The economy is mainly agrarian peasant based with a small monetised sector. Agriculture accounts for more than 57% of GDP employing more than 80% of the national labour force. The economy was vibrant in the fIrst few y':~ars after independence but registered steady declines in the 1970's and 80's largely due to mismanagement and the declining world prices of coffee and .·.copper the main exports. The oil crisis of 1970's only helped to worsen the sit):iation. The economy started to regain credibility after the current National Resistance Movement (NRM) took power in 1986. Since it. :-G.aIl1e to. power, many reforms have been implemented to revive the economy. These include liberalisation of the economy, privatisation of many state owned enterprises, strict fmancial discipline, export promotion and import substitution drives among many others. The reforms have so far registered trmendous progress. Inflation has been brought down from over 200% in 1986 to less than 10% in 1998. The economy has registered annual growth rate of GDP from negative fIgures in 1986 to approximately 7% in the last 2 years. Economic reforms coupled with other public sector reforms like democratisation, decentralisation, constitutional reform has: put Uganda's picture again in countries registering progress on the African continent.